One of Spotify’s better features – and a competitive advantage for its app in the streaming music market – are its personalized playlists. These compilations have long since expanded beyond Spotify’s Discover Weekly to include other selections, like Release Radar, your bottomless Daily Mix playlists, or the recently added Summer Rewind. 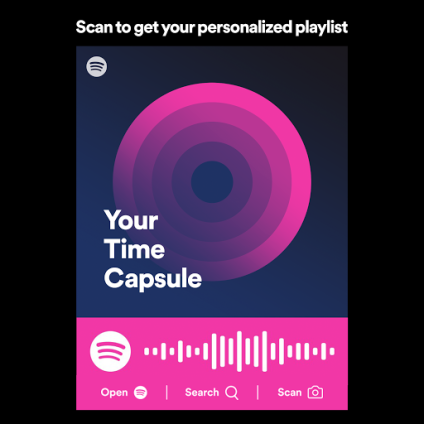 Today, Spotify is adding yet another personalized playlist with the launch of the throwback-focused Your Time Capsule. As the company explains, Your Time Capsule will gather together the 30 most nostalgic tracks from your teens and early twenties, in order to create what it calls “the soundtrack for a trip down memory lane.” The playlist itself will be around two hours long, notes Spotify, and will only be available to users over the age of 16 – because users needed to be old enough to be nostalgic! To get started, you can visit the web link for the playlist; visit the “Decades” section in “Browse” in Spotify’s app for iOS and Android; or you can look for it at the top of Spotify’s “Home” page. While these sorts of additions may seem minor, the draw of personalized playlists is one key way Spotify is able to retain many of its now 140 million total users (free and paid subscribers) and increase engagement with its application. Its Discover Weekly, for example, was so popular right out of the gate, it attracted 40 million listeners in its first year. Today, Spotify says that it makes a Discover Weekly for every user who has been on Spotify for at least two weeks. That means it’s making tens of millions of this playlist every Monday, we’re told. In other words, people aren’t just using Spotify because they can stream on-demand, they’re using it as a new form of radio – a playlist-driven experience that caters to just what you like. That’s not something that’s easily copied, either, for rival services without as much data to access or technology under the hood to make sense of it. Spotify has said in the past that even though other music services will build Discover Weekly clones, Spotify will still have a leg up in terms of personalization because of its use of streaming data. The company also continues to invest in its ability to improve its personalization and recommendation features, including via the acquisitions of companies like The Echo Nest, Sonalytic, MightyTV, and Niland, for example. Your Time Capsule is available starting today, for all users in 60 Spotify markets.